yeah the 250 to 300 hp range might not happen but I honestly don't know what to expect out of it all. This is my first turbo project, so whatever i can get out of it . . . cool. I just want to get it to work and then I can see where to go from there, just want to start with the right parts to make a setup and not a pile of junk that doesnt work together. Where can I find more on burtvorgon's creation or anything like it? Have you read through this thread? yeah, just finished. a lot of helpful information. I gues I am still a little confused on the "air box", does everyone contain the carbs inside a box? Is this box totally necessary, or is there other options to achieve the same goal without the box? No offense, but if you're asking about the need for the box for the carb, perhaps you don't understand the blow-through mechanics. I'd check out the reference texts mentioned in this thread and give them a few reads. Yes, the carb is located inside a "box" of some sort. This alleviates the need to seal any throttle shafts on the carb. The throttle shaft TO the carb needs to be sealed, but that is quite easy to do. The THEORY of the blow through downside, is the carb does NOT sense air density change...OK....so maybe NOT the most efficient in terms of scientific things, far be it from me to dispute that, but.......the beauty of a Weber is that you can change so many jets.......you can compensate for any "perfect wold" stoichiometic formulas. I had a long discussion with Turbo Tom many years ago, he said my system would not work......I have 4 boxes of trophy's in my basement that basically say otherwise. You are also blowing heated air, but, with a proper inter-cooler, that has not been an issue. From a safety stand point, the Weber 32/36 kinda naturally riches up at the top end under boost, which is not a bad thing in the real world of low octane pump gas. One nice thing, as Ak Miller said to me...the factory spent millions of dollars getting your intake manifold kinda right, so why not use it. That being said, whatever you do, if you put enough time and energy into it, can be made to work very well. Look at Julian's car now, well onto it's way as a nice daily driver, very tractable. Do NOT get lost in some huge HP number. Any 510 with a real world 150 - 200 HP is a fun car to drive, period. My car makes 250 to the rear wheels, and at times can be very, very scary of you are not careful! And, this is not done on pump gas. As the HP goes up, you need, no, let me re-phrase that..you HAVE to have better brakes, and, with that should go better suspension. AND...TIRES...you don't fart around on Sears Roadhandler rim protector, as the HP goes up. Bad tires will kill you quicker than you may care to think about. MY car fights for traction with street legal RACE tires, when the boost is up, in a corner. Did I say corner..yes....try using ALL your available power in and through a corner, at least that is what is fun for a bunch of us here, actually being able to really use our cars HP EVERYWHERE. 'nother style of airbox we built back in the 70's, I think Trevor has this now. Last edited by bertvorgon on 11 Jun 2012 16:44, edited 1 time in total. you can see the inter-cooler exit pipe heading to airbox. Thanks, I know I may not be coming off as an intelligent person but this whole concept is new to me. Thanks a lot for the pics, they really help guess I am more of a visual person. I have seen turbo cars in the past (with carbs) but just have never seen or heard of this "box" approach before. It has obviously been tried and true, I dont doubt that and i get it the reason for it. Maybe I am just making this harder on myself then I need to, and i appreciate you guys putting up with my (dumb at times) questions and i should just make a box for a weber and be done with it. I guess I was just wanting to use a pair of mikuni sidedrafts, and for the most part make an intake to weld to the velocity stacks and have that go to the intercooler and so on, in a backwards of flow direction but you get the idea. But now im learning I need a box around those too? I get it just thought it was going to be a simple task for lack of better words. I know a guy with an early corolla pretty much threw a holley on top with a very primative intake tube to the turbo and called it a day. I dont know what kind of numbers he was doing and I am sure now it wasnt working anywhere close as well as yours is. I am still learning all this, and definetly learning I dont know as much as I thought I did. Thanks again for your help. Don't worry about asking, this old school turbo stuff is rapidly disappearing, what with today's computer and fuel injection stuff. Unless you are planning some all out killer motor, blowing through one single sidedraft would be sufficient, IMHO. I had a friend back in the 70's who blew through his, did not worry about a box, and it worked pretty good for the most part. A turbo makes up for some of what air flow duel carbs do, in their naturally aspirated mode. It does require some sealing of vents, not sure what he did, which is why a box or plenum is a good thing. Jetting would be easier, which is why I stuck with the 32/36, you can jet the primary for nice cruise and idle conditions, and then have the flow of the secondary to go for full power. Fuel is to a certain extent is your limiting factor, to a boost level (HP), as your pump premium will only handle so much boost/ignition. Thanks, honestly this car was my daily driver for over a year. Now its my play car or car show car, which is why i want to keep it old school and not just throw an injected SR or KA in it. I have just recently been getting into the autocross stuff and thought a little extra power would be nice, but most of the year its just a street car so building an all out race setup on race fuel doesnt seem logical. So I also know how I am also limiting myself on pump gas. I know you have been doing this for years but your set up just blew me away, this being my first turbo build just want to take the easy route until I can better understand everything better I guess is the easiest way to put it. I dont remember everything he did but i do remember him spreading epoxy over some holes to seal them (I guess thats what he was doing anyway). I know either way is going to require some tunning and jetting. Maybe its dumb to try the sidedraft thing (mostly because there is a weber on the car right now) but I have always loved they way sidedrafts looked and the only thing better then that would be a turbo feeding them. Anyway thanks again for the knoledge, I still have some parts to gather but I will let you know how it all works out. 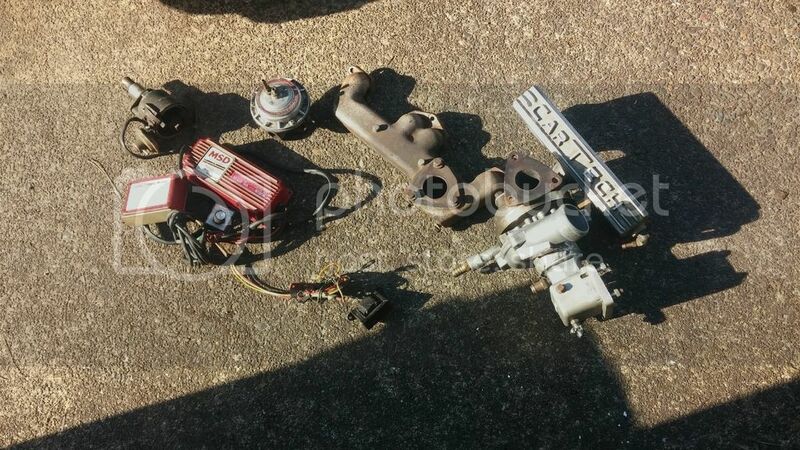 In looking at what that kit supplies, it is about sealing all the throttle shafts, etc., otherwise, under boost, a fuel laden mist is blown OUT the throttle shafts, and any other vent. This is both a risk, and, depending on wear on the carb, is a LEAK of your boost. Our criteria for sealing my box, was if we could get a .002" feeler gauge in there, it was a leak. I wish I could remember what Conrad did on his 510 convertible hillclimb/solo car, but, part of me says he did not care, as it was a crude but functional beater. If you do embark on this project with the blow through side draft, make sure you either phone them, or, do some research on the fuel delivery system, as that will be the key to any system you do..making sure it gets and maintains fuel pressure through the whole power band. Okay, guess we will see what happens. Thanks again to both of you, really helped out a lot. The only application I know of that made good use of electronics to control boost was the late-style Lotus Esprit Turbo 4-cylinder (the post-carb, fuel injected era cars with the "chargecooler"); they would let the motor run high boost if the intercooler was below a certain temperature, so it would get some wicked acceleration times for about 30 seconds (until the intercooler was cooking hot), then it would kinda back down the boost pressure/power output to a more sane level. I think it was something like 22psi max until it got hot, and then it would drop it down to about 15psi. After looking at all the flow maps a while ago, I came to the conclusion that I don't like the 60 trim, and I don't like the 57 trim, and these are what a lot of people are using, but I don't understand why. They have pretty narrow flow ranges, aren't really that high flow in useable ranges, are prone to surge at mid-rpm engine range with high boost applications, and don't have super high compression efficiency... so why are they so popular? they are readily available from Garrett. Does that mean you should run one? NO! Not at all because that is bad reasoning. Most of the people running a 57 or 60 would probably be happier with a 50, but they have been sucked into the glory-number game; the 57 and 60 compressors only flow more air than the 50 compressor in useless areas of their flow maps, so they don't really flow any more useable air, but they make huge sacrifices elsewhere to give those few useless numbers; bad trade!!! A good hybrid turbo would be a TO4E 50 trim, with a T3 Stage 3 turbine, and a 0.63 T3 exhaust housing - that will give you a wide enough range to run anywhere between an honest dyno-able 220HP to 375HP. so here you have it... a TO4E/T3 hybrid, 50 trim compressor, Stage 3 turbine wheel and 0.63 A/R housing will make your car go so fast, you'll probably scare yourself!!! A ball and spring MBC will do the same thing. No boost allowed to the wastegate until the preset maximum is reached. This allows considerably faster boost than a bleed type MBC. A MBC is not nearly as sophisticated as an electronic controller, but it does get the job done. You can get combination MBC's that combine a B&S to control the low boost setting ( to allow fast spool ) then an air bleed to fine adjust the high boost level. Bumping this up. I just read through the thread.. very educational. I'm also rereading through Maximum Boost by Corky Bell and Turbochargers by Hugh MacInnes. I very recently came up on a Cartech setup for an L20b, and was wondering if I could pick some of your brains about what would be a nice, mild setup on an L series for this kit. At this point, I'm wanting something streetable, probably not running anything higher than 7 pounds of boost. It's a draw through setup, set up to be used with a downdraft carb. I'd like to be able to run on pump gas(we have 92 octane here for premium). I'm also checking out widebands to dial in the A/F ratio as closely as I can, just so that there's no guesswork there. The setup has an MSD ignition box, as well as a boost retard box.. Is it realistic to attempt running this on a stock, rebuilt bottom end? Or are cast pistons just completely out of the question.. I'll keep reading and doing homework, but just trying to hit all the sources possible. Thanks guys!